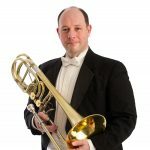 J. Bryan Heath, a native of Slaughters, Ky., is currently the bass trombonist of the Louisville Orchestra and has also performed in that position with the Owensboro Symphony, Illinois Symphony, and Orchestra Kentucky of Bowling Green. He is now a doctoral candidate in trombone performance at Indiana University. Heath’s principal teachers include Raymond L. Conklin, M. Dee Stewart, and Arnold Jacobs. An active teacher, he served as adjunct trombone faculty at Indiana State University from 2006 to 2009 and at Murray State University in the spring of 2012. As a freelance artist, he has performed with the Chicago, Nashville, Alabama, and New Mexico symphonies. Having grown up on a horse farm in rural Kentucky, Heath enjoys reaching back to his roots by serving as the lead singer, guitarist, and yodeler in the traditional cowboy band Suede Saddle.